Tailgating season is just days away, and with it will be a new set of rules. The most notable change is that ID’s will now be checked upon entry, and those over 21 will be wrist-banded, according to a Sept. 9 press release. “The goal of the wristbands is to make it easier for the Tarleton Police and Texan Alley staff to spot people who may be underage. This was a measure that was put into place due to the tremendous growth that Texan Alley has seen over the last several years and should provide police and Rec Sports staff with an easier way to approach underage drinking,” said Assistant Director of Recreational Sports Daron Trussell. Alcohol consumption will also be limited to strictly the area of Texan Alley (lot P20), and no drinking games or drinking game supplies will be allowed into the area. Beyond the new alcohol guidelines, there will also be charges for reserving spots for tailgating, like the $10 fee per tailgating space (two parking spots). 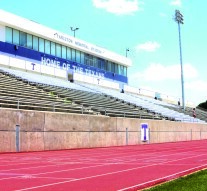 “The biggest change to Texan Alley for 2015 is the addition of an online reservation system, paying for tailgate spots and moving the event to the visitors side of the stadium,” said Trussell. Reservations can be made online in advance of the games. Trussell also said that all proceeds from tailgating will go to the Tarleton Cheer teams, who will also be working the gate at Texan Alley. • No glass containers are permitted. • Entrances and traffic lanes within Texan Alley must remain clear at all times. • Trash and debris must be cleaned up and disposed of in provided receptacles, including those for recyclables. • No open-pit fires are allowed. Charcoal and wood-fire grills are permissible, but fires must be contained to the grill. • The disposal of hot coals and ashes from grills are prohibited within Texan Alley or on campus. • Guests who exhibit disruptive behavior or interfere with the rights of others will be asked to leave the premises. • Pets must remain on a leash and in the owner’s control at all times. Pet owners are responsible for any injury or damage caused by their pet. Always pick up after your pets, please. • Tarleton does not take responsibility for lost, stolen or damaged personal property. Tailgating spaces and/or personal items should be attended at all times. • Participants and organizations cannot sell food, products and/or raffle tickets, campaign for office, distribute petitions and/or lobby for votes without prior written approval from the Rec Sports Office. 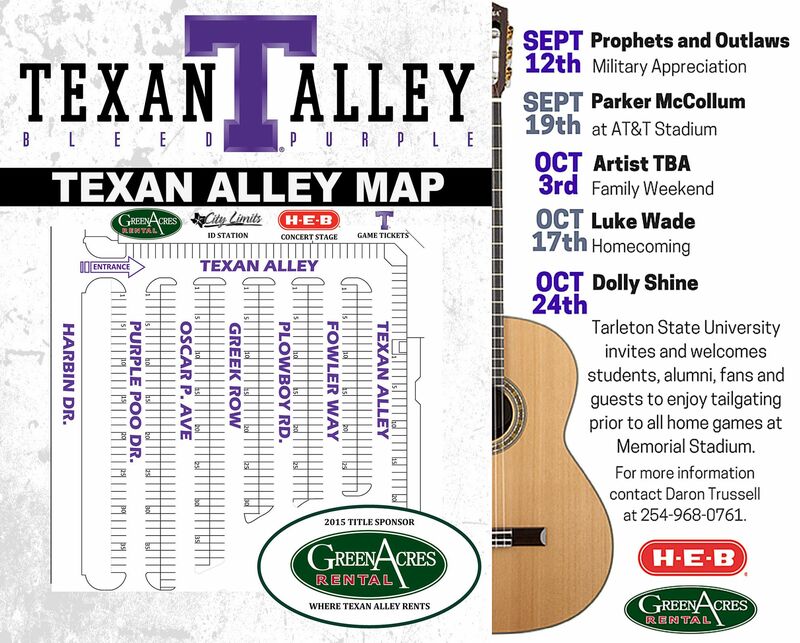 A full list of the Texan Alley guidelines can be found on the Texan Alley web page.